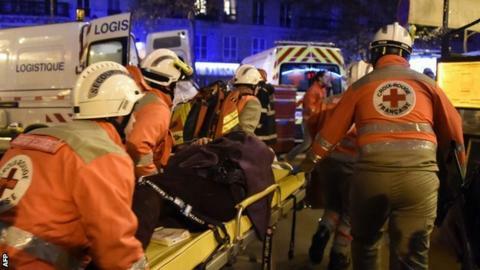 Glasgow Warriors' European Cup match in Paris has been postponed after a series of attacks across the French capital. Nearly 130 people were killed in gun and bomb attacks on Friday. Glasgow, who flew into Paris on Friday, were scheduled to face Racing 92 at Stade Yves-du-Manoir on Saturday. Head coach Gregor Townsend told BBC Scotland: "Our thoughts go out to the people of Racing, the people of Paris, and the whole sporting world is behind Paris just now." The Warriors squad is due to travel back to Glasgow around Sunday lunchtime, as originally planned. Racing 92's ground is six miles away from the Stade de France, the scene of three deaths while France were playing Germany in a football friendly. Townsend, who played in France for Montpellier, Brive and Castres, continued: "It was obviously very concerning for the supporters that came across for this and would have been in Paris at the time. "Coaches and players had family and friends across and that was the main concern, that they were safe and it sounds like they all were. "We are very connected with our supporters and they were looking forward to supporting the team out here in Paris against a new opposition. For them to be caught up in what happened is shocking but obviously our thoughts go out to the people of Paris first of all." Townsend broke the news to his players early on Saturday morning that the match against Racing would not go ahead and he says it would have been hard for his players to focus on a game after witnessing the awful scenes in Paris. "We knew the game was off when we spoke to them about 8.30am. We didn't know whether it would go ahead the following day or potentially the Monday but to get the news quite quickly after that that there was no game this weekend was probably a relief. "The players are professional and were obviously starting to get in to their match-day routine. I think if the build-up had gone on more, they obviously would have been thinking about what had gone on."